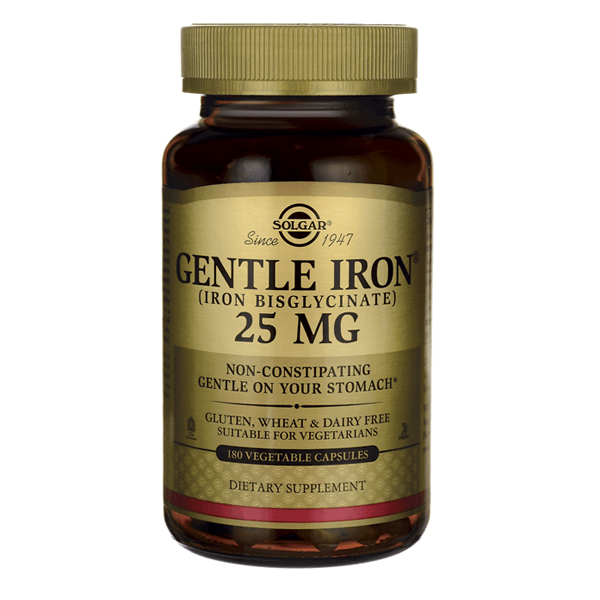 Non-constipating form of iron (iron bisglycinate). Solgar’s Gentle Iron? 20 mg Vegetable Capsules contains Iron Bisglycinate, a well tolerated, non-constipating form of Iron. If you are pregnant, nursing, taking any medications or have any medical condition, please consult your healthcare practitioner before taking this product. Accidental overdose of iron-containing products is a leading cause of fatal poisoning in children under 6. KEEP THIS PRODUCT OUT OF REACH OF CHILDREN. In case of accidental overdose, call a doctor. Iron, microcrystalline cellulose, vegetable cellulose, vegetable magnesium stearate.